If you should ever be faced with a mouse sighting while in a room full of children, you may found, as I have, that you have a tricky diplomatic situation on your hands. (I should say before I go any further that I have always been lucky enough to work at very nice, well-maintained schools. However, kids drop crumbs, and crumbs attract mice, so there you go.) First of all, some of the natural adult reactions to a mouse – shrieking, fleeing, calling an exterminator – would involve a certain loss of dignity if done in front of a class. But just as tricky is the fact that the majority of the children in the room are often cooing at the mouse and squealing in delight. You see, for most elementary students, mice are familiar friends from literature. Often at least one child will declare, “Look, it’s Ralph!” And you wouldn’t want to hurt Ralph, now, would you? Of course not. I’m sure there are all sorts of psychological reasons why children might identify with mice and why mice make such excellent characters in books for young children. Rather than delving deeper into that, I’m going to restrict myself to commenting on a few of my personal favorites (with a write-in candidate on behalf of my students). 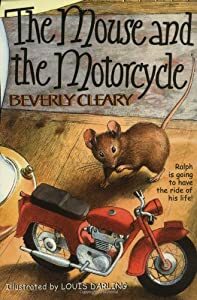 Ralph from The Mouse and the Motorcycle (written by Beverly Cleary). Ralph is my own personal childhood favorite mouse. In the first book in his series, Ralph, a resident of a tumbledown hotel, meets a boy named Keith who comes to stay at the hotel … and, more importantly, meets Keith’s toy motorcycle, which is perfectly sized for a mouse to ride. He finds that if you make a “pb-pb-b-b-b” noise with your mouth, the motorcycle actually runs. Ralph and Keith slowly build a realistic friendship, and in the end, Ralph’s driving skills give him the chance to help his new friend. I absolutely loved this book as a child, and it holds up well to rereading as an adult. Cleary has developed a remarkably textured world, and her descriptions from a mouse-eye’s view makes me wonder how much time she spent crawling around on the floor to get the details just right. She also walks the tricky line of animal fantasy beautifully: her mouse has recognizable human traits like curiosity and stubbornness without losing his mousy qualities. Children who are longing to be taken seriously themselves often connect to the seriousness mixed with humor with which this book is written. I will say that the vocabulary is denser than I had remembered as a child – within the first few chapters readers will find the words “chromium,” “momentum,” and “antimacassar” – so it’s a good chance to talk to children about using context to figure out words or making a list of words to investigate later. Hermux Tantamoq from Time Stops for No Mouse (written by Michael Hoeye). Hermux is a more recent entry to the world of mousey literature, featured in a series of four books. 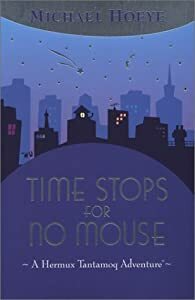 In Time Stops for No Mouse, Hermux, a mild-mannered watchmaker who lives in a town filled with rodents, finds his quiet world turned upside down when a beautiful aviatrix named Linka Perflinger drops off a watch to be repaired at his shop … then disappears. His quest to find her brings him into contact with all kinds of shady characters, including the menacing Dr. Mennus (ha ha) who is searching for the Fountain of Youth. I often sell this book to readers by describing it as a “mousey Indiana Jones.” I also have to reassure them that the action really will pick up eventually, since they are sometimes a bit skeptical after a few chapters. The book starts with some incredibly descriptive chapters that I found charming and well-written but that children find a bit … slow. This story makes a fantastic read aloud: the chapters are very short and often end with cliffhangers. Adults will enjoy the references to common adventure/mystery clichés (the diary of a lost Amazon adventurer! a doomsday machine! multiple secret identities! ), and I have particularly enjoyed watching children encounter some of those clichés for the first time. The anthropomorphized mice and other rodents are well-developed, and Hermux makes a very appealing underdog (or undermouse?) to root for. Tom Thumb and Hunca Munca from The Tale of Two Bad Mice (written and illustrated by Beatrix Potter). This was one of my very favorite Beatrix Potter books as a child; I remember the lovely illustrations so well that I must have read this book hundreds of times. Tom Thumb and Hunca Munca come out from their home in the walls of a house to discover a dollhouse conveniently stocked with lots of food. Much to their disappointment, the food is all just pretend, and they proceed to ransack the house out of a mixture of curiosity and pure mischief. I remember feeling a secret kinship with Tom Thumb and Hunca Munca’s naughtiness when I would look at my grandmother’s Victorian dollhouse as a child: everything was so appealing, but so untouchable and unreal that some little part of me wanted to try pulling the food off the plates just like the little mice. (In fact, I’m fairly sure that as a child I had the confused idea that this book was written about my grandmother’s dollhouse.) The paintings in this book are truly beautiful, and, although some of the references will be a little obscure for children, they will still find the naughty little mice genuinely funny and appealing. Although I think this book is best enjoyed in the classic Beatrix Potter format of a tiny hardcover, you can also find the entire text of this book online (see, for example, this link). Geronimo Stilton from the Geronimo Stilton series. On behalf of my students, I feel I must mention a current very popular entry to the world of literary mice: Geronimo Stilton, the star of over fifty books (not counting special editions and spin-off series). Geronimo is a reporter at the Rodent’s Gazette. Despite his shy and skittish personality, he is constantly pulled into fur-raising adventures. My third graders absolutely love these books. They have literally read most of the copies in my classroom to pieces (several are barely held together with tape), and Geronimo Stilton books are among the most popular choices from our book orders. The students assure me that these books are exciting and hilarious. Unfortunately, I cannot speak to those points very clearly because I have never made it all the way through one. 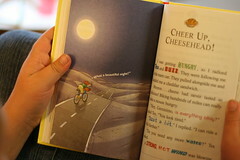 The mouse-related puns, hyperactive plots, and incessant word art (the word big is printed BIG! the word scared is shivering!) all give me a migraine. Still, I will put on my Sympathetic Teacher hat and say that the word art is probably good decoding support, the repetitive structure is probably reassuring to new readers, and anything that gets kids reading is all for the best. Nevertheless, I would recommend buying this series for the children in your life, then just letting them summarize the story for you rather than trying to read it for yourself.